Saved from sescoops.com by way of New Japan Pro Wrestling. 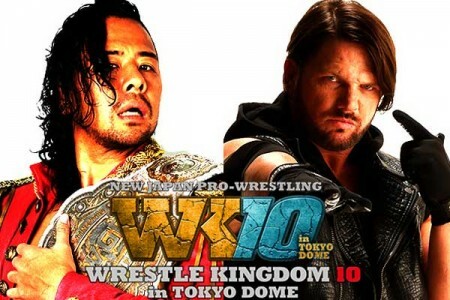 Chris & Kevin know they are late to reviewing New Japan Pro Wrestling’s Wrestle Kingdom 10 but that didn’t stop them from recording a review of it. Why didn’t they just talk about NXT? Will they in the future? Do our friends on the Facebook forget about some of the goofy antics of NJPW when they review these shows? Like the New Japan Rumble? Do they forget about goofy, interference laden finishes like that of the four way tag team match with Red Dragon, The Young Bucks, Matt Sydal & Ricochet and Rocky Romero & Baretta? By the way, did anyone this Baretta was a big guy in the WWE? How about the stupidity of having a six man tag team title match? Will it help the Briscoes to stay off ROH TV defending these belts? The ROH Title was defended by Jay Lethal against Michael Elgin on this show. Can the guys find new ways to insult Truth Martini? A small break takes place. While that is taking place, Chris finds some breaking news about John Cena to include on the show. They move along to talk about Kenny Omega’s match with Kushida. How many people can pull off the Marty McFly look? Will Doc Gallows & Karl Anderson be better off in the WWE tag team division instead of New Japan’s? How much did Dave Meltzer love the interference in the Goto vs Naito match? Again, do our friends on Facebook not point these shenanigans out on purpose? What ridiculous spots were there in the Ishii vs Shibata match? Was it well wrestled for the style though? Of course Chris & Kevin talk a lot about Shinsuke Nakamura vs AJ Styles since both are coming straight to the WWE roster. Will they be there in time for the Royal Rumble? Does Nakamura translate better to an American audience than Kazuchika Okada or his nemesis Hiroshi Tanahashi? Which match up was the better of the two? Were they both great matches? Find out the answer to these questions and more when you click the link below!